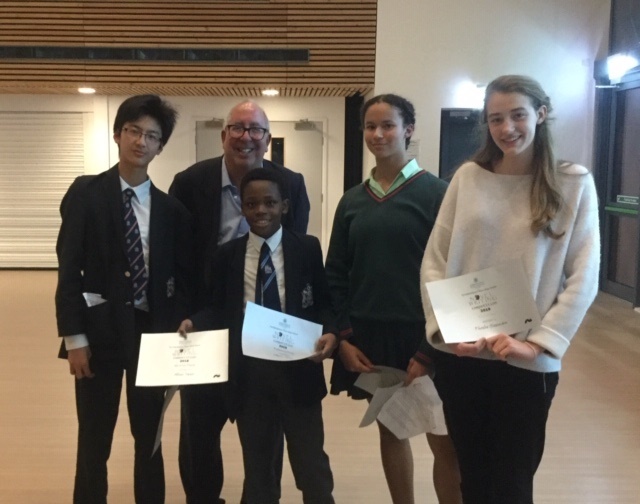 A competition for aspiring young writers took place last Thursday (11 October) after school. Over the summer, 21 Haberdashers’ Aske’s students from across both schools took up the challenge of writing the first ten pages of a full-length novel. On the day, all the competitors came together for a brilliant event, where extracts were read out, ranging from crime to school fight scenes, thrilling fantasies, and so much more. For me, the competition was, initially, a nerve-racking event, but after hearing the first words of someone else’s story, quickly became an evening to simply listen in wonder at other works of fiction; I was taken on a journey through so many different worlds and ideas. As many of my friends know, my favourite past-time is to sit down with a book and read and read, so hearing so many new ideas, ranging from the comical, to the serious, to the grave, was a dream come true. After all the stories were read out, and all the readers were breathing sighs of relief at the extracts being over, the judge – the literary agent Luigi Bonomi – came out. He told us about his work, which included reading thousands of pages of different novels (it sounded exhausting). Announcing the winners from both schools, he had us all gripping our seats. The winners he chose ranged from a Year 8 with a talent for public speaking, to a sixth former with a pre-holocaust tale. All the winners were extremely deserving, and the night was definitely one to remember.